Asteroids High Score Save Kit -- Plus extended scoring! Permanently saves the top 10 scores and initials. Extended Scoring! increasing the maximum score to 9,999,990. Installs in minutes! Simple Plug and Play. No soldering required. Easily reset the high scores at any time. Special high quality gold plated machined header pins on daughter card. 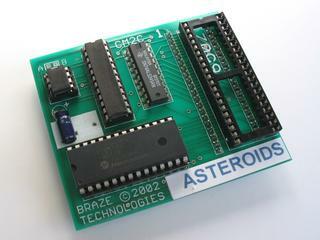 Provides a perfect mate with your Asteroids CPU socket. High reliability and strength for a long lasting connection. Daughter card snaps firmly into place. See picture. Top 10 extended high scores and initials are remembered permanently, long after the game has been powered off. No batteries to replace ever. Kit is based on the REV2 version of asteroids. To insure proper compatibility, a REV2 vector eprom is needed. See Revisions to determine if you have the REV2 or REV1 code revision. A REV2 vector eprom is included as part of the kit at no extra charge. Easy to clear out the high scores when desired. Simply put the game into selftest (using the cabinet selftest switch). Once in selftest mode, press (and hold) all four of the following buttons (left,right,fire and thrust). The screen will imediately show "ERASED" indicating the high scores have been cleared out. This is the same procedure used by Asteroids Deluxe to reset the high score table. See Clearing High Score table for detailed directions. Fixes the "missing last letter on the 10th score" bug. There is a bug in the Atari REV2 code wherby every time you start a game, the last letter (initial) in the 10th score is erased. This kit codeset has the fix to that errata. Something not working right? Check out the Trouble Shooting Guide.